Outer: Plush organic bamboo velour, can come in various, gorgeous LWI and dip dyed options, and can be dyed custom to your requirements or left plain. You can have snaps to match your choice of colour which makes the nappy very eye-catching and appealing! Core: there is a hidden layer of organic cotton fleece with a core of microfibre making this nappy very absorbent! Inner: a soft to the touch organic bamboo velour, 2 lay in boosters that are topped with organic bamboo velour, these are seperate to aid drying time. Expensive. Very cute and customizable -which i like as you get exactly what you want! When my nappy arrived i could not stop squishing it and stroking the unbelieveably soft orangic bamboo velour, knowing this was going to be next to my babies skin i just had to pop it on her for a quick half an hour before washing it to get it up to absorbency! I like the fact they can come in so many colourways and you can add embroideries if you wish. I like that the Medium/Large fits my daughter at 14lbs so i know im going to get my monies worth before she out grows it! I like that they are organic and natural, this means the fabric is more breathable and better for your LO's skin - this nappy helped with my DD's nappy rash as the creams didnt make a difference! Im pleased that they are WAHM made and supporting WAHMs all over (these are from the USA) also they are individually made and there is alot of care that goes into making each one. When my daughter wore it she looked so comfortable, it fitted well and once it was up to absorbency it lasted all night with the 2 lay in boosters provided with it - i was very impressed as my daughter sleeps or 11hours! I went and bought another one straight away! It cleans well, and with it being bamboo velour it is less likely to stain as some other materials, it took a while to dry on the line but once dry it was still so soft and silky! I love my bedbugs! 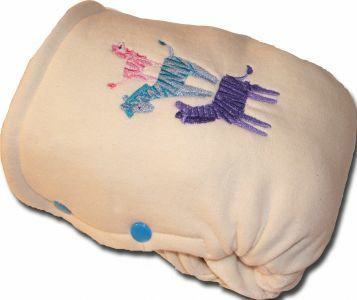 A very well made nappy that will be pride of place in your nappy stash! The going rate for these second is very good so you can easily sell on and make alot of your money back, making them even more appealing! this nappy is amazingly absorbant. i didnt prewash it because im impatient! and put the medium on my 6 month old at midnight and at 9am when i came to change him the nappy was wet but not 'sopping' wet. once prewashed this nappy does do up to 16 hours (should you child sleep that long!) and works brilliantly under wool or pul. i have used the M and M/L on my son and the toddler on my daughter, we have never had any leaks from them and they are the most realiable night nappy in our stash. the fit of this nappy is very good. its a very flexiable and soft nappy, which means the sizes fit well over a range of weights, and have very good cross over. for instance my 2.8 daughter fits a toddler and a M/L (although for absorbancy we use the toddler) and my six month old fits the M and M/L. this means they get more use out of them, and therefore are very good value for money. you can get these nappies in a range of colours, some of which are instock at various nappy sellers websites. there are custom slots available on the holdens landing site, in which you can specify colours and add embroidery. these naapies are the height of luxury and look amazing. the colours stay bright and do not fade despite the fact i wash at 60.
the sizes are not labeled on the individual nappy. which is fine if you only use one size, but if you have two in night nappies you have to hold them up against each other the determine which is the M and which is the toddler. this can be a pain if you only have one clean and the rest are in the bucket! also these are probably the most bulky nappies we use at night.